The Mobile Buddy is the companion you need when you go on a journey or for a long period away from home. 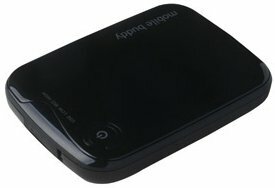 You can easily attach all your mobile devices like MP3/4 players, mobile phones, camcorders, tablets and so on to this portable battery pack. Because of its universal USB plug it can be attached to nearly every device. So don't get stuck with an empty battery any longer and make sure you have this Mobile Buddy with you.